TAVISH Scott has dubbed the legal challenge against Northern Isles MP Alastair Carmichael “a political show trial funded by nationalists”. The Shetland MSP spoke in the morning session of the first of four days of evidence scheduled at a specially convened Election Court in the Court of Session in Edinburgh. Scott said his Liberal Democrat colleague “deserves a chance” to continue to serve his constituents. Carmichael is due to give evidence in the afternoon session. The Liberal Democrat MP’s election victory in May is being contested by four of his own constituents from Orkney. The case could trigger a by-election on the grounds that Carmichael lied about his involvement in the leaking of a memo intended to damage First Minister Nicola Sturgeon ahead of May’s general election. 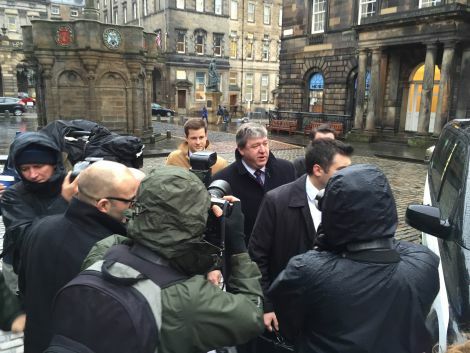 Carmichael’s legal agent, Roddy Dunlop QC, argues that his actions were political, not personal. Fiona Graham, Timothy Morrison, Phemie Matheson and Carolyn Welling argue that Carmichael damaged the chances of his opponents by making false statements. Scott was among six witnesses due to give evidence in the hearing. Scott was the second witness of the morning. First was Fiona Graham, 57, who is one of the “Orkney four” who have brought the petition to court. She spoke of her “shock” on hearing that Carmichael had admitted he sanctioned the release of the memo. The court was shown footage from the Channel 4 News interview in which Carmichael said that the first he had heard of the memo was when he received a phone call from a journalist. But the MP later admitted he had in fact authorised a special adviser to leak it. The bid to challenge Carmichael’s win raised more than £125,000 through online crowdfunding to cover legal costs. Supporters of Carmichael have taken £8,000 in a similar online fundraiser. Carmichael has held the seat since 2001. In May he held onto the seat with a much-reduced majority of 817 votes over the SNP’s Danus Skene. Witnesses’ evidence is not being broadcast live – as an earlier hearing was – but the submissions from each lawyer will be televised online by STV. The memo, leaked to the Daily Telegraph, suggested that Sturgeon had told the French ambassador she would prefer to see David Cameron remain as Prime Minister, which both Sturgeon and the ambassador denied. Following a Cabinet Office investigation, Carmichael apologised to Sturgeon and accepted that “the details of the account are not correct”. Opinion: Will Tavish pay for Carmichael’s lie?